My Mom liked to bake, but she didn't make doughnuts. The only doughnuts I remember eating as a child were store bought. My favorite were those small cake doughnuts coated with cinnamon sugar. 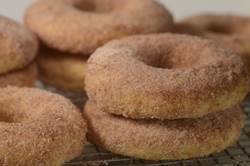 I always loved the grittiness of the cinnamon sugar together with the soft and tender texture of the doughnut. Of course, being a baker, I wanted to try making them at home. In the past I always made cake doughnuts that were deep fried. But for this recipe I wanted to make them a little healthier. So I decided to bake the doughnuts, rather than putting them into a deep fryer. I was happy with the results. A tender and sweet tasting cake doughnut with a nice dose of cinnamon flavored sugar. Cake Doughnuts get their rise, not from yeast, but from baking powder. The batter is similar to a sponge cake batter, and once made, it does need to be refrigerated for about an hour until it's firm enough to roll. While you can buy an actual doughnut cutter to cut out the doughnuts, I just use two round shaped cookie cutters (one large and one small for the inner hole). Now, as soon as the doughnuts are baked, they are brushed with melted butter and dipped in cinnamon sugar. While these doughnuts are best the day they are made, they can be covered and stored at room temperature for about two days. Baked Cake Doughnuts: In a separate bowl, whisk or sift together the flour, baking powder, salt, and freshly ground nutmeg. In the bowl of your electric stand mixer, fitted with the paddle attachment (or with a hand mixer), beat the eggs and sugar until thick and a pale yellow (about five minutes). Beat in the vanilla extract. With the mixer on low speed, alternately add the flour mixture (in three additions), with the milk and melted butter (in two additions), beginning and ending with the flour. (The batter will be quite soft.) Place the batter into a bowl, cover with plastic wrap, and refrigerate for about one hour (or until the batter is firm enough to roll). Then preheat your oven to 350 degrees F (180 degrees C). Line a baking sheet with parchment paper. Once the batter has chilled sufficiently, place on a floured surface. With a lightly floured rolling pin, roll the dough to a thickness of about 1/4 inch (.5 cm). Cut the dough into 3 inch (7 cm) rounds, using a lightly floured cookie cutter (you will need a smaller cookie cutter to cut out the center "hole"). Place the doughnuts on the prepared baking sheet. Gather up the scraps, re-roll, and cut out remaining doughnuts. Bake in the preheated oven about 14 - 16 minutes, or until the doughnuts are set and the bottoms are a light golden brown. Do not over bake. Remove from oven and place on a wire rack. Cinnamon Sugar Topping: Melt the butter in a small saucepan. In a separate bowl, combine the sugar and ground cinnamon. As soon as the doughnuts come out of the oven, using a pastry brush, brush each doughnut with the melted butter and then dip in the Cinnamon Sugar, making sure the entire doughnut is covered in the sugar. Place on a wire rack to finish cooling. Best freshly made, but the doughnuts can be covered and stored at room temperature for about two to three days. Makes about 12 - 3 inch (7 cm) doughnuts.